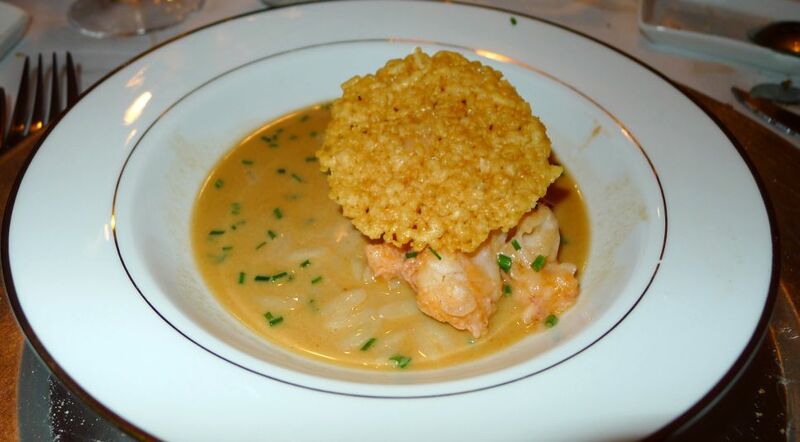 Macaroni and cheese is my favorite dish from the French Laundry! This dish is very lengthy in preparation work and the broth alone will take at least a few hours to reduce to the correct consistency! 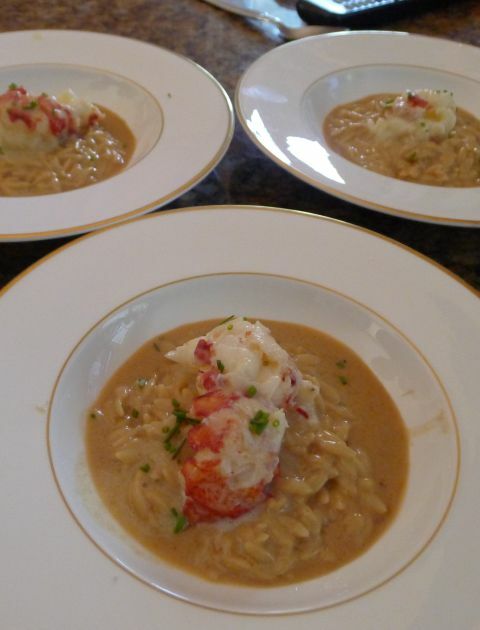 Macaroni and cheese is made with a creamy lobster bisque combined with enriched orzo pasta with mascarpone, lobsters gently poached in butter and finished with a parmesan crisp wafer. This dish was served at my French Laundry at home dinner party for my friend's birthday and we all agreed that this dish was simply incredible. 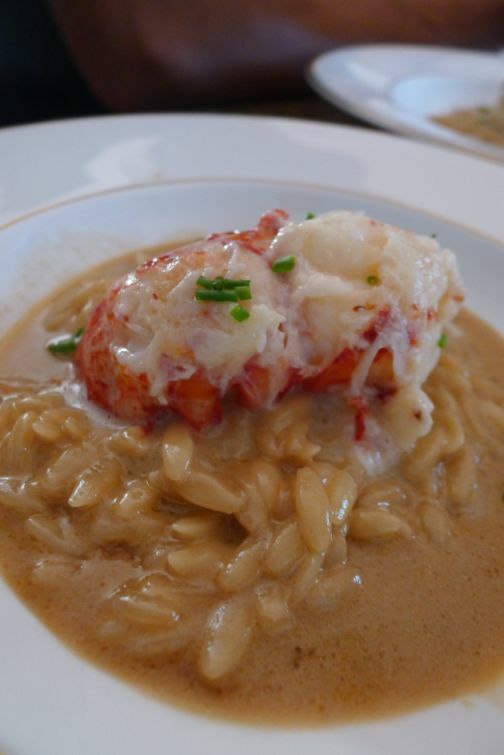 Basically how can you go wrong with a whole poached lobster in butter! This is how the dish was served! 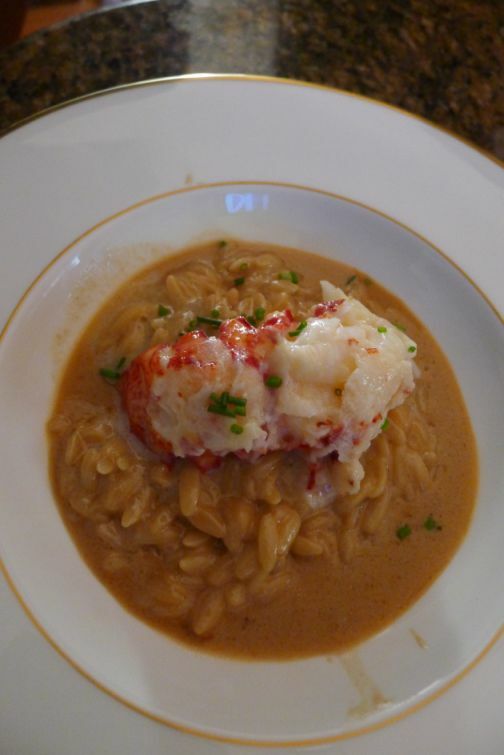 The cheese wafer was removed so you can see the poached lobster with mascarpone enriched orzo and a creamy lobster broth! 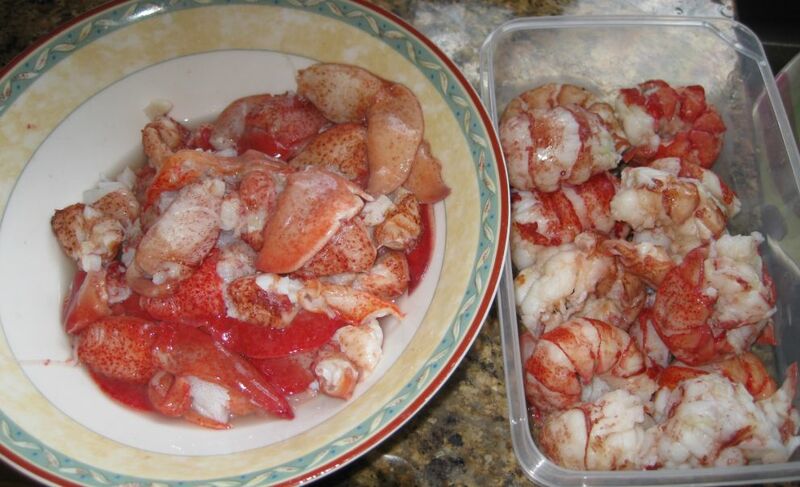 The recipe I am giving you is for 6 people but since I have a lot more guests tonight I bought 14 lobsters. 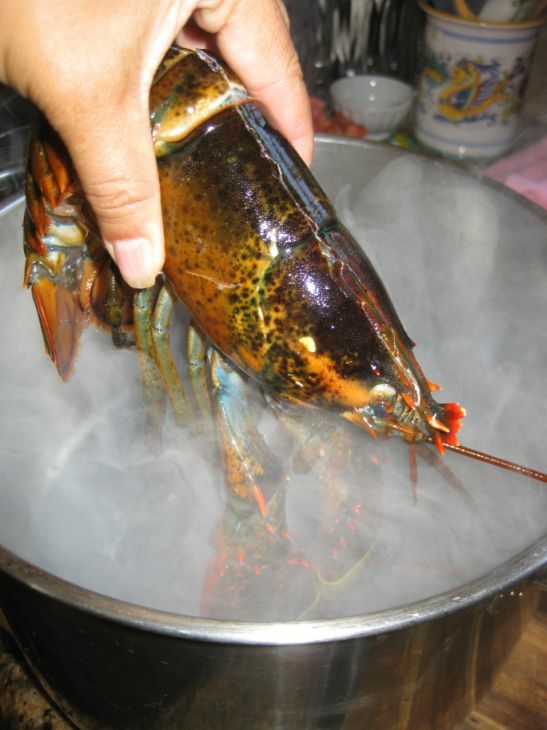 Place lobsters in tight-fitting heat-proof container such as stockpot. To determine how much steeping water you will need, add in cool water just to cover, then drain it off, measure it and place in large pot. 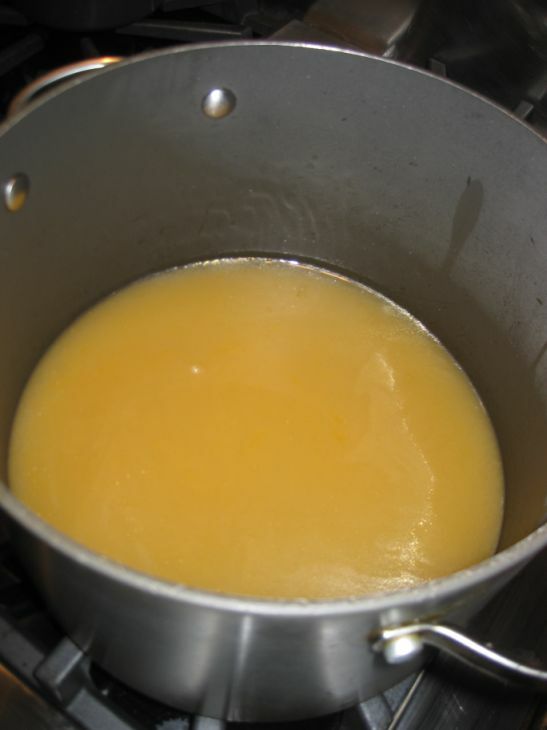 Bring water to boil and add in 1/2 cup white distilled vinegar for every 8 quarts of water. 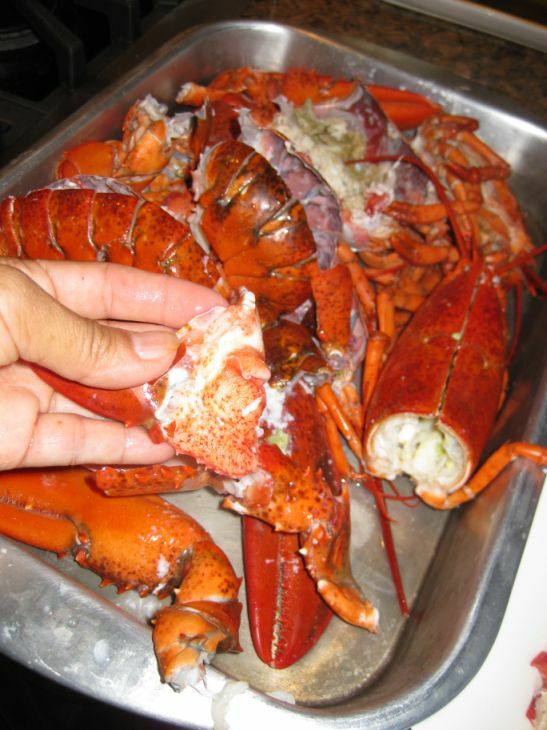 One at a time, using towel or possibly rubber gloves to hold warm lobster, grasp tail and twist and pull to detach from body. Twist and pull off claws. 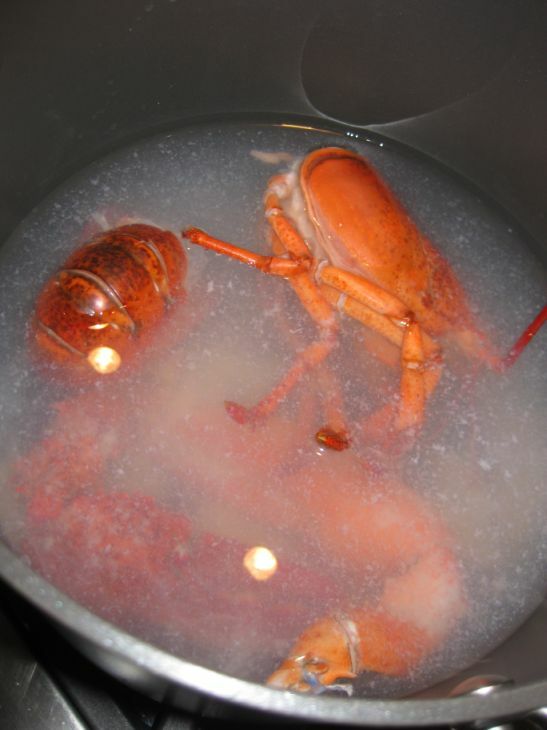 Return them to warm water for 5 more min. 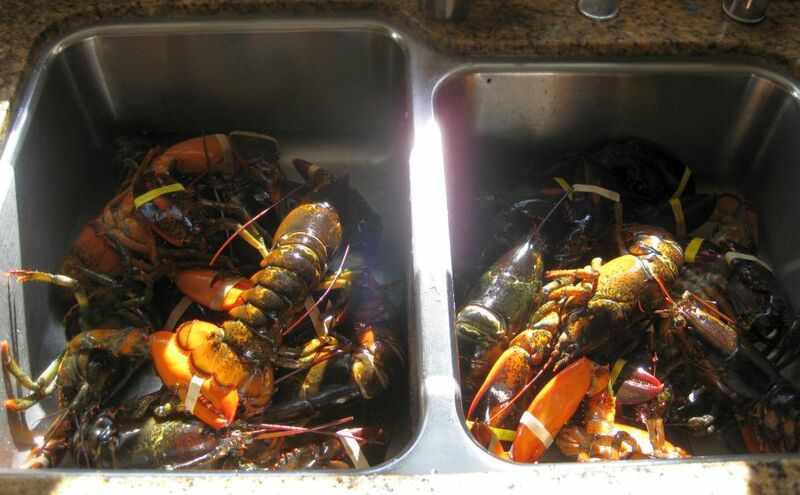 Remove the lobsters from the hot water and put them into a large tray. Hold tail flat and twist tail fan to one side. Pull off and throw away. Gently use your fingers to push through tail end pulling meat out through large opening at other end. 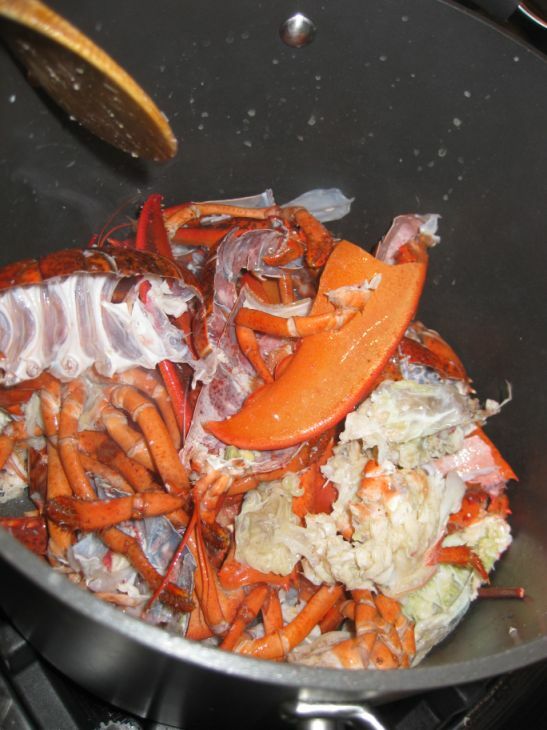 Save shell for broth. 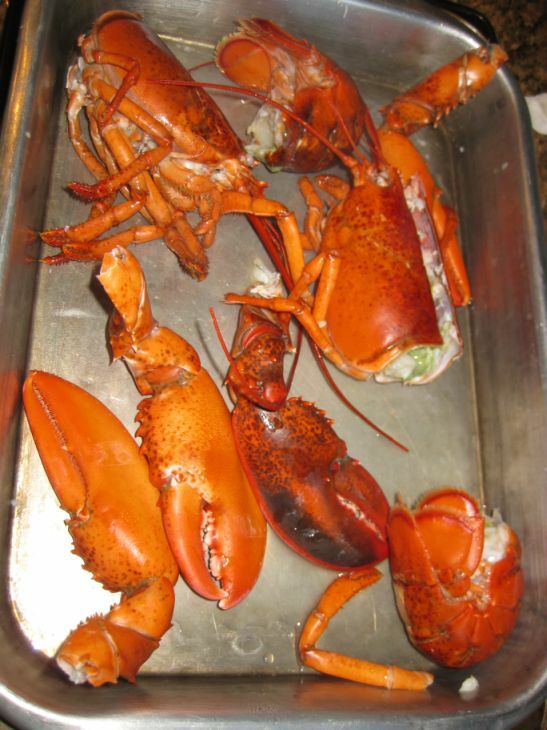 This what I got after removing on the shells from 14 lobsters. 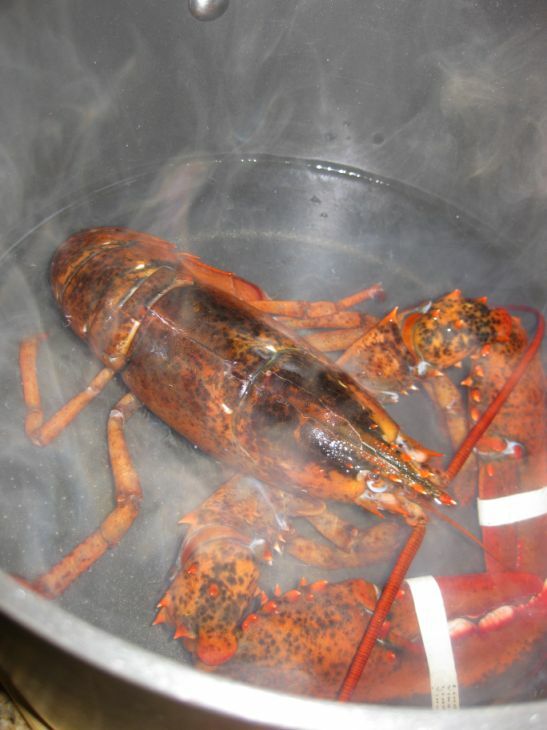 Refrigerate the lobsters. 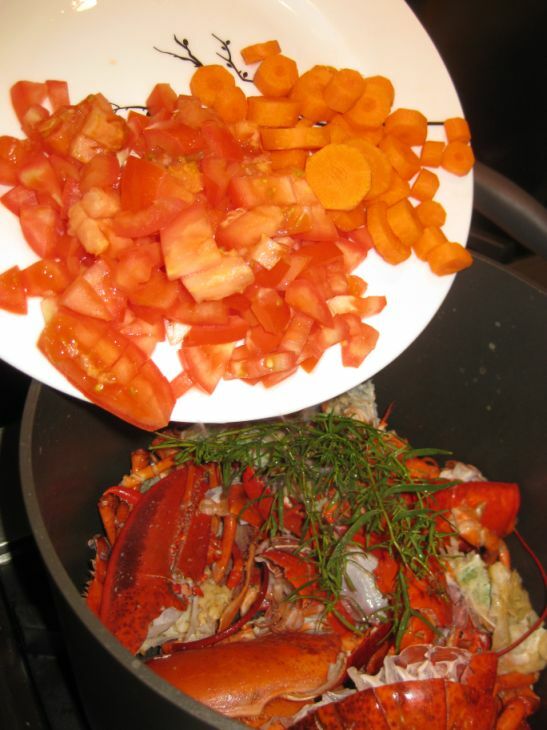 ..over shells and vegetables with water, and bring to boil. Skim off any impurities which rise to top. Reduce heat and simmer over low heat for 1 hour or so. After 1 hour the stock will be reduced if there is still a lot of stock continue until the stock is reduced to 1/3 of the pot. 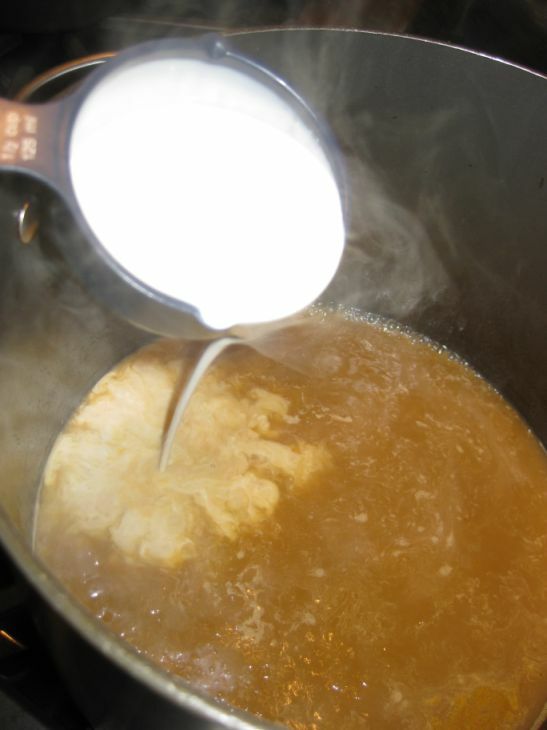 Add in heavy cream, return to simmer and cook, skimming occasionally, till broth is reduced to 2 cups- about 30 to 40 min. Strain through fine strainer into container, discarding any solids remaining in strainer. Cover and chill broth several hours to chill, or possibly up to 3 days. 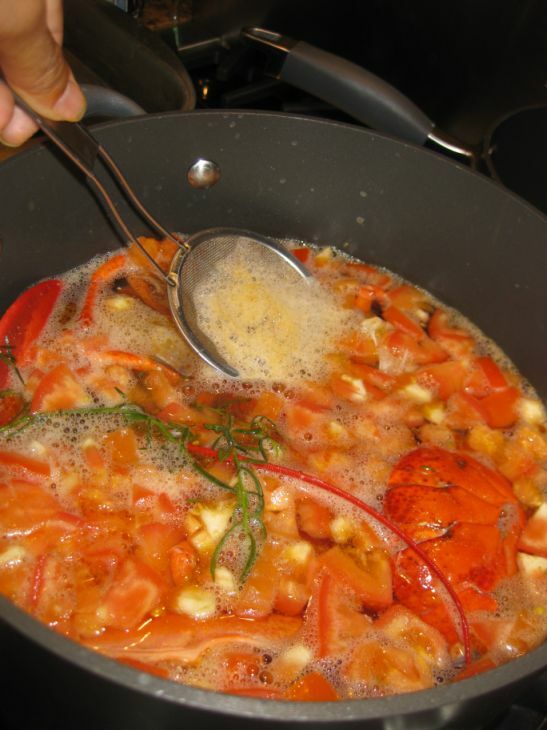 Cook orzo in boiling lightly-salted water 8 to 10 min. 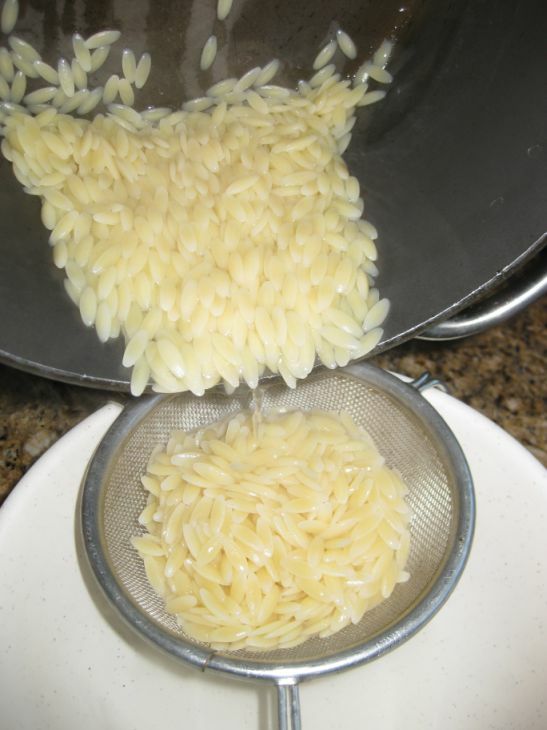 Drain cooked pasta in strainer and rinse under cool water. Shake strainer to remove excess water. 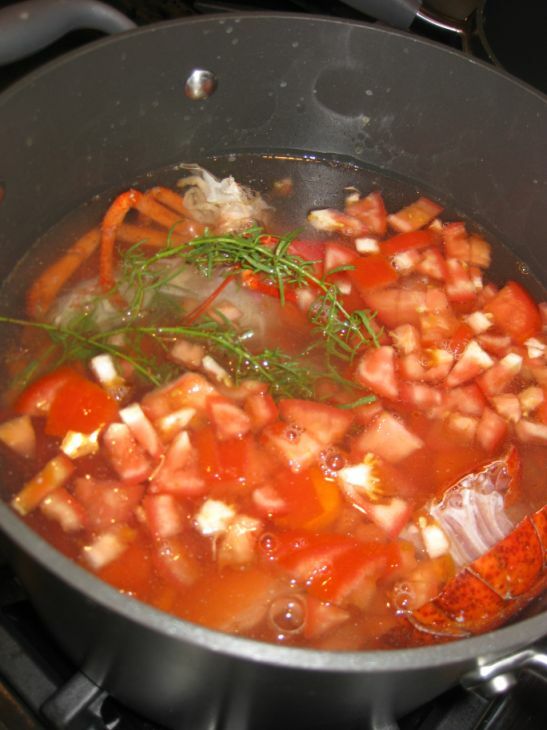 Add pasta to lobster broth. 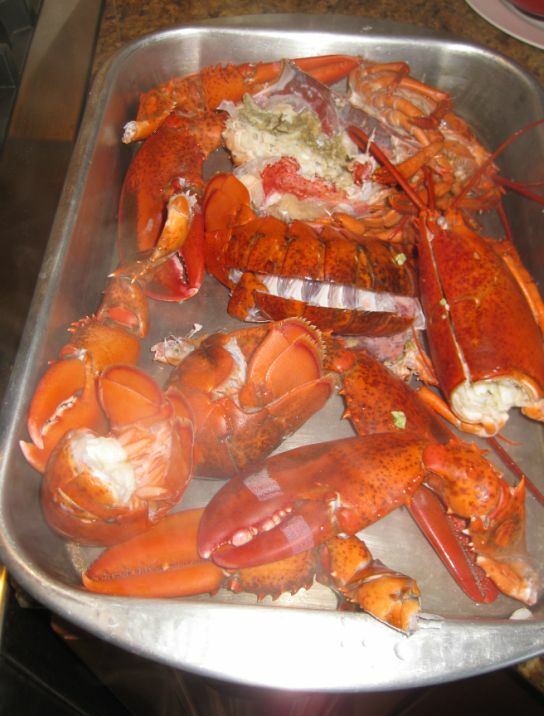 If lobsters have been refrigerated, bring to room temperature. 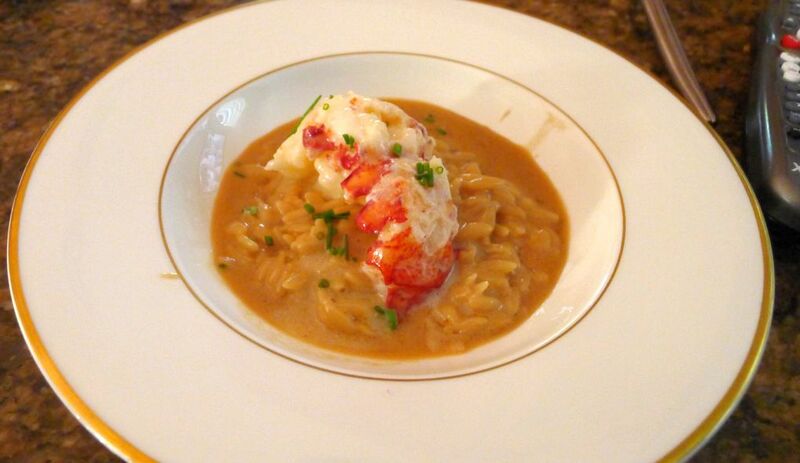 Heat orzo and lobster broth to simmer. Add in mascarpone and season with salt to taste. Let simmer 1 minute, then remove pan from heat and keep hot. 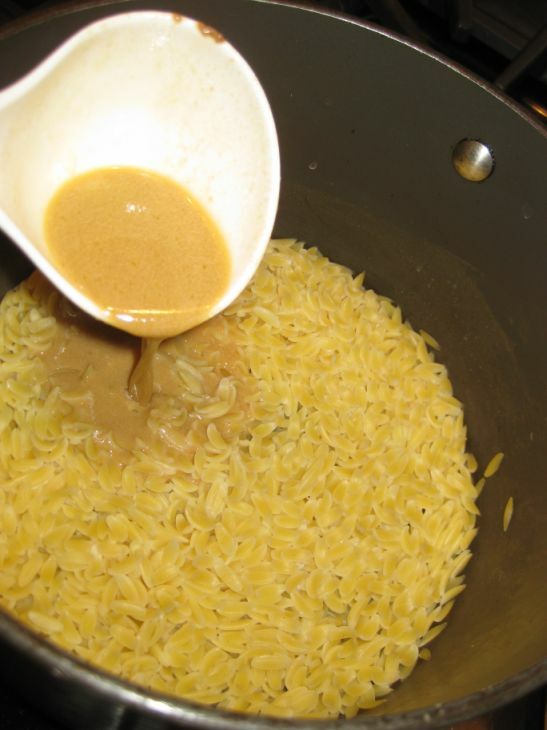 Mix should be thickness of risotto. Preheat oven to 325 degrees. Line a baking sheet with a silpat . Sprinkle about 2 tablespoons of the cheese in one corner of the silpat. 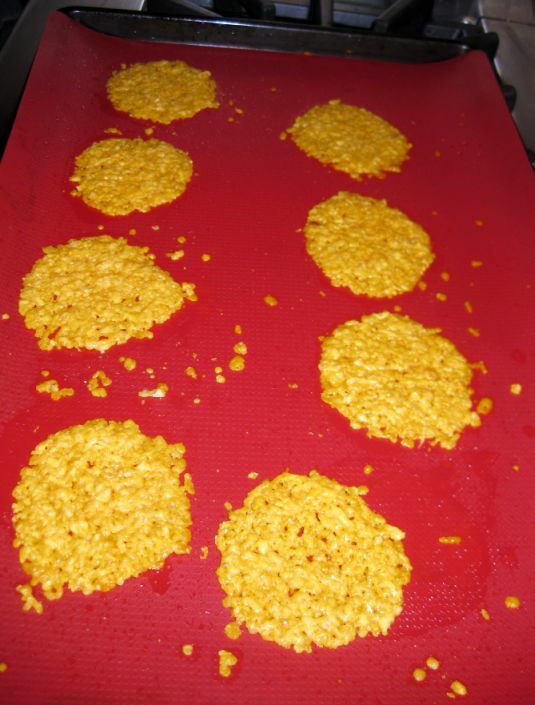 Use your fingers to spread the cheese into a 2 inch circle. Repeat with the remaining cheese. You should have about 12 rounds. Bake for 8 to 10 minutes or until golden brown. Use a small spatula to transfer them to a paper towels. They will be soft when they are removed but stiffen as they cool. 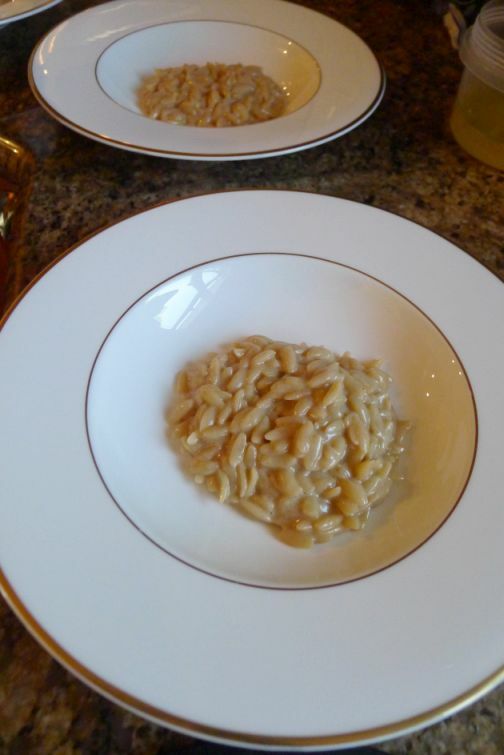 Put a few spoons for orzo on a plate. 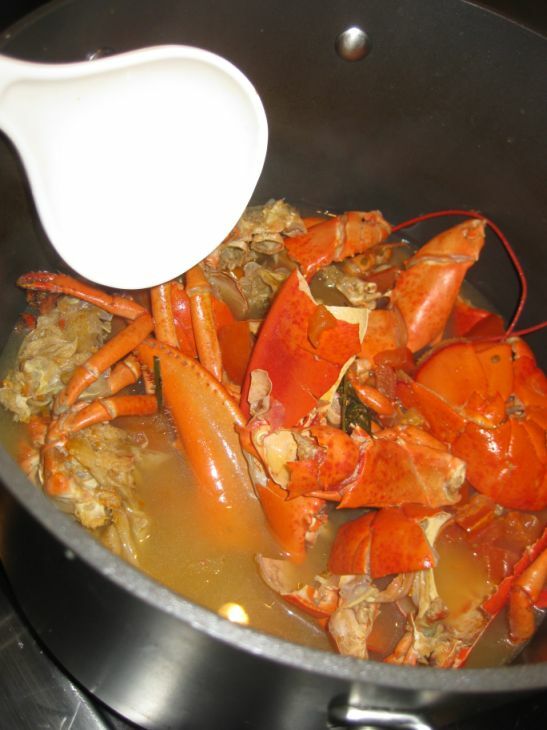 Add the broth and put the lobster in the middle of each plate. Put the Parmesan crisp on top and it is ready to be served.